A water loving perennial lily with brilliant red star-shaped flowers in late summer and winter. This is a great plant to grow in groups next to a pond or in a damp position with the roots in water. These can also be grown in pots and kept indoors for a wonderful autumn/winter display of flowers. It makes good cut flowers, which grow to a height of about 60cm. The Scarlet River Lily prefers damp positions, full sun and composted soil. 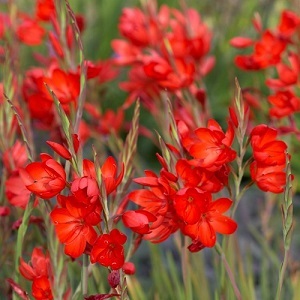 Although it prefers damp conditions, it is a very adaptable plant that grows well in most borders and through a hot dry summer. 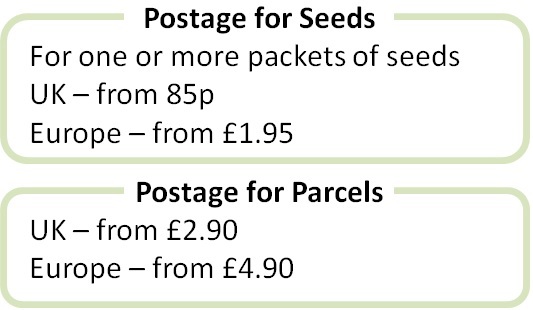 Pack of 30 seeds. Sow in spring to autumn. Flowering starts in the second or third season. Plants generally flower in red, with the possibility of some in pink or white. Sowing instructions and a colour photo are printed on the packet. Sow in spring or autumn in moist seed compost and cover lightly with seed compost or vermiculite. Keep at 10-20°C (preferably 10-15°C at night) and seedlings emerge in 2 – 4 weeks, sometimes up to two months. Pot on and grow until the plants are ready to plant out after the last. Protect autumn/winter seedlings in a coldframe or greenhouse. Grow Plants start to flower in the second or third season. They are semi-evergreen, losing their leaves in winters and staying evergreen in warmer western gardens. Tidy up plants as necessary in the spring after flowering. Mature plants can be divided in spring. Plants naturally form into clumps over time and self-seed in the right conditions.